Cycling to fight against cancer, diabetes and other life-threatening illnesses. 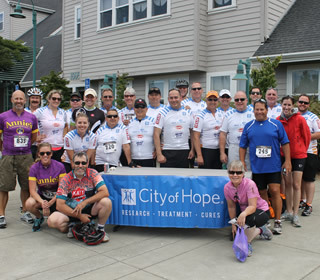 The NCFIC Bike to Hope represents a team of cyclists committed to raising awareness and funds for City of Hope. The team works together, rides together and shares an interest and involvement that will greatly impact the lives of patients at City of Hope and around the world. In 2015 the Bike to Hope team raised over $100,000 for City of Hope's research and treatment programs and in 2016 we hope to raise even more! Our City of Hope with team is composed of food industry retailers, manufacturers, and sales and marketing companies. This year the Bike to Hope team will once again join the Giro Bello bike ride in beautiful Sebastapol, California cycling along wineries and gorgeous scenery for either a century, metric century or family fun ride. In addition to personal fundraising, we offer wonderful opportunities for companies to support through corporate sponsorship. For more information on corporate sponsorship opportunities, please click here. Every cyclist has their own personal story — we invite you to visit their personal pages to find out more about why our group is so passionate about this event. It's not too early to join us. Please consider participating or sponsoring an individual or our entire dedicated group of athletes. We've reached 79% of our $100,000 goal! Bike to Hope Goes Social!